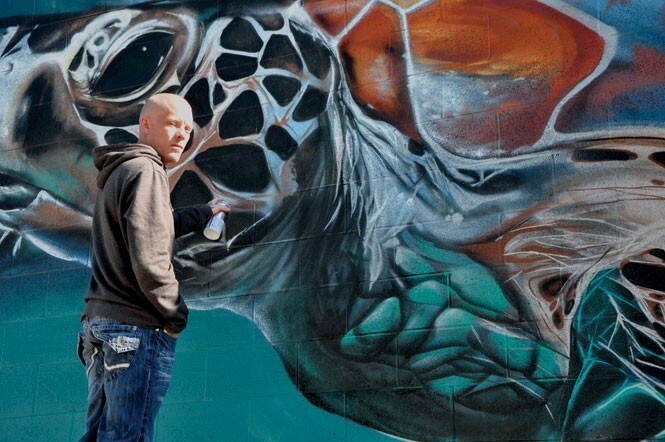 Artist Shae Petersen straddles the line between graffiti artist and street artist—his work is legal, so he doesn't consider himself a graffiti artist, but his tools of the trade are cans of spray paint rather than a paintbrush. His painter handle is SRIL (pronounced "surreal"), in tribute to the surrealism of Salvador Dali, and he creates massive murals on building walls—some commissioned, others for his own enjoyment (with permission). Peterson's work includes portraits of Walter White from the AMC series Breaking Bad, a giant polar bear swimming, and the face of Albert Einstein (and the unnamed work-in-progress above). His work is realistic, looking less like spray paint than a photo. See his art on his website, SRILArt.com, or on Instagram, @srilart. Why did you decide to paint graffiti, and why such big murals? I literally can't do anything else. I can't paint with a brush, I've tried to use acrylics and it's awful. I'm so used to the medium, that it's almost a limiting factor. If I want to do an art show, every canvas I paint has to be at least a certain size. Doing small-scale work, for me, is far more difficult because of the medium I've learned and gotten mildly proficient at. 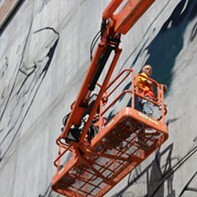 Compared to other places you've painted, how is Salt Lake City's graffiti scene? In the past couple years, it has definitely exploded, but there aren't a lot of spots. Here, you could pretty much see all of what we have to offer in just a few hours of driving around. The scale is larger in other cities, and they are far more prominent. Here, I've got a wall in Sandy and somewhere tucked away downtown, but they're not huge murals along State Street, or in the heart of Main Street downtown. Walls are a little harder to come by, especially if they're large murals, rather than the wood-panel storefront temporary-art spots. Are the local governments pretty tolerant? It depends on the neighborhood. Downtown, I haven't had any issues. South Salt Lake, no problem. I think, in Sandy or more residential-type areas, there is some pushback, because there are more vocal residents who put pressure on it. For the most part, I haven't had any significant issues or complaints. What are graffiti and street artists up against? This whole Street Art Throwdown show was not the best representation. There's always a thing that comes up with street artists and graffiti artists—they're not the same thing. You've got guys who have been doing graffiti for years and then all of a sudden, you've got guys like Banksy making millions. The exposure is good for everybody, whether it's positive or not. A guy like Banksy is going to provide a lot more opportunities for guys like myself because he's creating awareness, and he's creating a trend, in a way. While I may not personally like what he's doing, I definitely respect what he's doing for the movement, or the craft, as a whole. Do you ever paint over your walls? I like to keep things temporary. There's a certain level of progression; maybe what I painted a month ago, I'm capable of painting much better at this point. It's always trying to progress and push myself. I don't like keeping old stuff up very long if I can help it. There are a few exceptions: If it was a commission thing, and the owner wants the piece to stay longer than usual, or maybe it's something that's out of my way or harder to get to, or requires scaffolding—things like that. For the most part, I would prefer they didn't last long. What's the difference between graffiti and street art? The term "street art" is relatively new. There were graffiti artists—people who created art with spray paint. Illegal—legal, either way, they were graffiti artists. Now you've got people coming in with different types of mediums. They may paint with a brush. There's a whole lot of varying opinions on the subject. Because I don't do illegal work, I wouldn't necessarily consider myself a graffiti artist, either, because graffiti, in a sense, is illegal. I'm also not a street artist because I come from more traditional graffiti roots. People take the terms really seriously, and I don't. I have one wall that I keep secret, and nobody really knows where it is. I have a little bit more freedom there, because I'm not worried about people seeing it. It's in a spot that's difficult to find. It's really the only place I can paint and not worry about how people perceive it, or I can try something I haven't done before if I'm not entirely confident of how it's going to end up. Where is your "Fear and Loathing" piece? That one and the "Breaking Bad" piece are still up, on different parts of the same building—Club 90. I did a commission piece for the owner at the time. We started with the south-facing wall of Club 90. Once we painted that wall three or four times, we (with friends and other people I invited to paint) got the east wall, which is where "Fear and Loathing" is. Because it was so popular, I left it longer than I would have, and then they switched owners. I know the city was giving the previous owner pressure to paint the wall over, and they weren't huge fans, but she was an old-school club owner and she wasn't having it, so she wasn't listening to what they had to say. There are no big murals on State Street, right? I just secured a huge wall, right on State Street, and I have put a little thought into what it's going to be. I think I'm going to do something totally different from what I'm used to doing. It's a pretty high-profile spot, pretty centrally located too. Once I start working on it, it will be difficult to miss. In between a few commission pieces, hopefully, I'll start on it by the end of the month. It looks really horrible, at least in my mind, until the last 20 percent when it starts coming together. I'm always really insecure until that last part, because you get these weird looks, like, "Does this guy even know what he's doing?" I try to keep that phase as low-profile as possible. I'm not antisocial, but if it's in a phase where I'm not comfortable, I don't hang around it. I get out of there as soon as possible. But I don't try to hide it.